I thought that cakes for a movie known for its eye-popping visuals would be a little more…three-dimensional. (Sorry, I just couldn’t resist!) In any case, this sheet cake and cupcakes don’t look very appetizing. 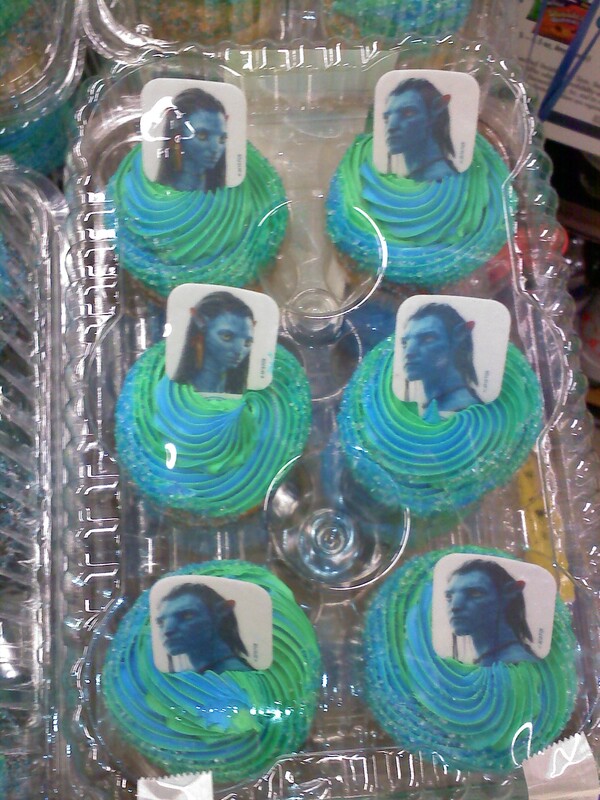 I saw these at the QFC by my house, and they were right by a huge display of “Avatar” DVDs. 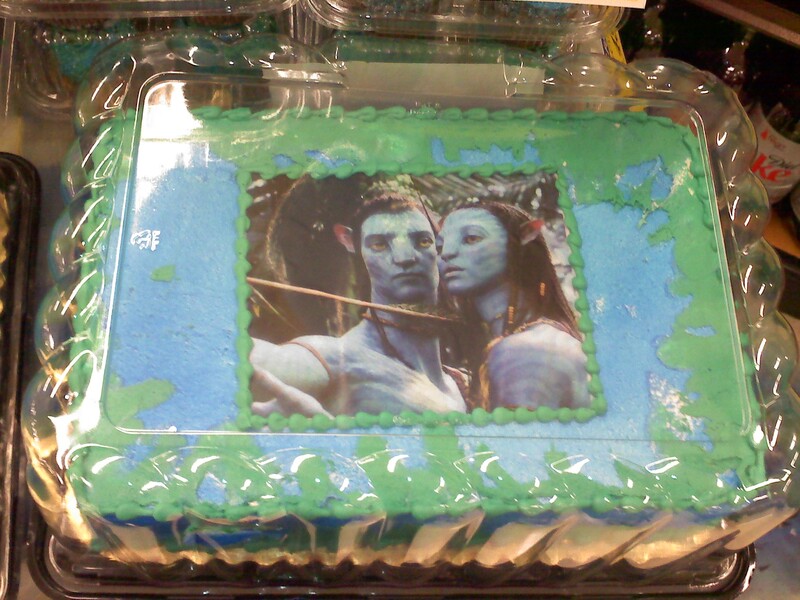 So the idea is buy the movie and some Na’vi cake to go with it? Maybe for a 10-year-old’s birthday party, but true sci-fi geeks have standards. Yes, that’s right. I said bacon on a skewer. This totally random but tasty food can be found at TIG Asian Tapas Bar in Seattle’s Pioneer Square. My friends and I were lured in to TIG by the promise of a 4:00-10:00 p.m. (!) happy hour. What we found was a extensive menu of Korean dishes and sushi rolls. The happy hour pricing is impressive, with some items only costing $2 (including said bacon). And there is no beverage minimum. There is also no false advertising. We ordered bacon on a skewer, and that’s exactly what it was–one thick piece of bacon pierced by a stick and drizzled with hoisin sauce (I guess to make it qualify as an Asian tapas). If you want to take things to the next bacon-y level, there’s also spicy bacon on a skewer. My guess is that it’s fatty pork goodness covered with sriracha. I also had a salmon and avocado sushi roll and an enormous seafood pancake, which only cost me $7 total. The food was decent but unremarkable. TIG is one of those restaurants that makes you wonder how in the world it stays in business. My two friends and I were the only people in TIG besides our server and the bartender. Korean pop music blared while completely unrelated videos screened on the wall by our table. I guess it does a lot of business on the weekend when it turns into more of a nightclub. That would explain the miserable state of the women’s bathroom. To celebrate National Volunteer Week, United Way of King County is hosting a volunteer project April 20 from 4:00 p.m. to 6:00 p.m. at Marra Farm. The farm grows organic produce for local food banks. All volunteers will get free tickets to that night’s Mariners game vs. the Baltimore Orioles. Spots are limited so sign up today!